Read last month's Geotimes poll results on hybrid cars. Next month, Geotimes takes a look at forensic geology  how investigators use geologic evidence to solve crimes. How often do you watch crime dramas like CSI? How well do you think science is portrayed in crime dramas? Changing technological, political and economic landscapes are opening up new opportunities  and new challenges  for meeting the world's petroleum needs. The United States and Norway have taken vastly different approaches for developing oil resources offshore while addressing environmental concerns. Offshore exploration for petroleum is reaching deeper than ever before. Listening to the planet's creaks and groans allows researchers to "watch" what is happening to oil and natural gas belowground. From skirting mountain drops and avoiding hostile townspeople to fighting off predatory animals, working in the field can be hazardous. Citizens can be effective in promoting policy change: Take the case of a group of local citizens who rallied the support of Congress and their community in installing a seismic network. Proactive strategies to mitigate natural hazards will develop a strong society prepared for any disaster. The sky is falling on science and technology in the United States  or is it? Canada contains large deposits of tar-like oil sands, which give the country the world's second largest proven crude oil reserves. Mining for the sands, however, is technologically challenging. 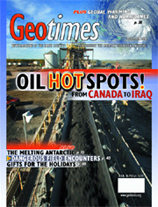 Read more on page 22 and 32, and read throughout the issue about other oil "hot spots" and new technologies. 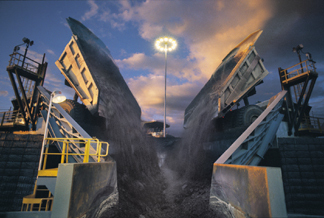 Photo is courtesy of Syncrude Canada. Upper right: Hurricane Charley was the first of four large hurricanes to hit Florida this past August and September. Some researchers say that the occurrence of extreme events may increase in coming years as the climate warms. Read more on page 38. Image courtesy of NASA/Orbimage. Later this month: Geologic Column: Was Chicken Little Right?